In today’s first reading God uses the Gentile ruler Cyrus to accomplish divine purposes. When the Pharisees try to trap Jesus, he tells them to give the emperor what belongs to him and to God what belongs to God. Paul is giving pastoral encouragement and reassurances to new Christians living in an antagonistic pagan environment. Their commitment of faith, love, and hope makes them a model for other new Christians. * Why do you think Isaiah could praise Cyrus, a non-Jew? * Currently in the U.S., the major parties are divided over the proper role of government. What in these lessons suggests that Christians should take the debate about the role of government seriously? * How does faith shape your economic decisions -- buying, saving, giving, and the rest? * What do you think Paul means by “grace”? By “peace”? If you were sending this letter by e-mail, what would you put in the subject line? For the Week: Thank you, sovereign God, for providing good order and government. Throughout the Day: Create in me a generous heart. Blessing to Share: Grace to you and peace. For mealtime, say responsively: Let the heavens rejoice: Let the earth be glad. we thank you Loving God. Give to God what is God’s. 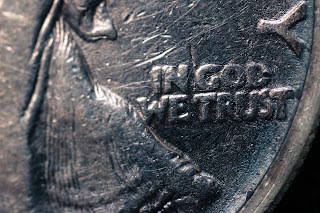 During your devotional time, pick up a quarter and hold it in your hand. Feel the weight of the coin. How do you feel as you hold it? In what ways does money have power in your life? In what ways can you align your values with how you use money? Reflect on this. How could you use this coin to make a difference for someone or something else? At the end of the week, pray about your experiences with the coin. St. Paul included sentences of thanksgiving in most of his letters that gave thanks for the people of the early congregations who were visibly living their faith. Create five small notes that say “I thank God for you!” Slip these notes into the doors, backpacks, or cars of people you see living out God’s love.